The capacity utilization graphs allow you to keep track of how much work your resources have been assigned to at any given time. Above every task, there is a colored line. Each line indicates how packed that period is (and not just a task) for a resource, by combining the 'Busy Time' of all the stacked tasks within that period. Take a look at the screenshot above as an example. Resource 'ASUKA' has two tasks scheduled. The colored graph tells us that the combined capacity of this resource during that period has gone over 100% (200%). Asuka herself or her employer would have to make adjustments so as to relieve her from an impossible work schedule. The capacity utilization is calculated based on task utilization and business hours. You change the colors of the graphs or turn them off entirely. Doing so will open the settings regarding utilization. Doing so will enable or disable the capacity utilization graphs. In any resource or project view, the graphs have appeared or disappeared. You can add custom ranges and choose between different coloring options. 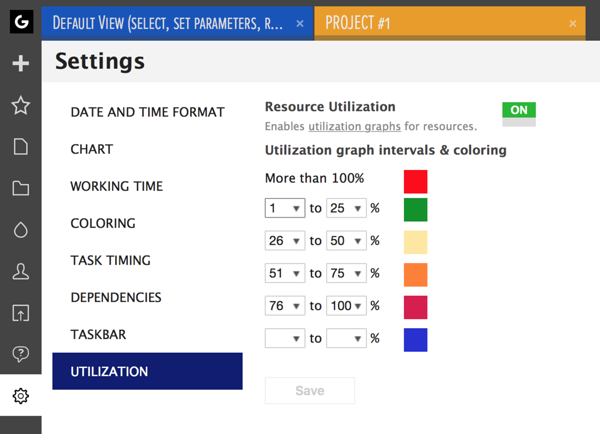 In any resource or project view, the graphs will appear in the colors you have chosen. Did not find the answer to your question regarding capacity utilization graphs?